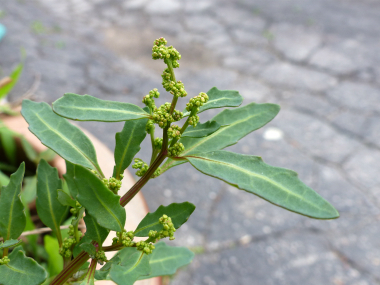 The species within genus Chenopodium are difficult to distinguish between. They often include several varieties whose identification usually requires the use of a microscope. One of the important distinguishing characters is the texture of the seed-coat. Oak-leaved goosefoot has gained its name from the shape of its leaves which resemble that of many oaks. 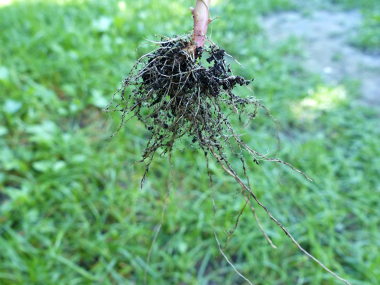 Oak-leaved goosefoot is an annual that flourishes in nitrogen-rich soil. Distinguishing Features: The specific epithet glaucum originates from the bluish-green underside of the leaves, which is caused by a dense covering of hairs. The stem is hairless and can be green or red-striped. 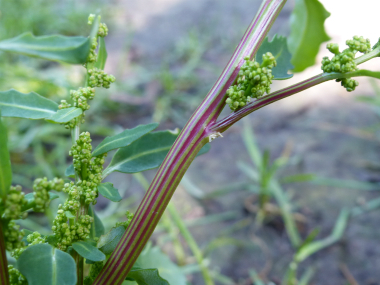 Chenopodium glaucum is an annual. Flowers: The flower has individual floral spikes that are up to 4cm long; there are several small flowers per cluster. Some flowers may have pedicels up to 0.5 mm. long. Each mature flower is about 2 mm. across, consisting of 3-5 greenish sepals, 3-5 stamens, and a pistil with a pair of styles; there are no petals. The sepals are lanceolate to ovate, bluntly tipped, and glabrous. The stamens protrude outward with yellow anthers. It blooms from June to September, and the seeds ripen from August to October. 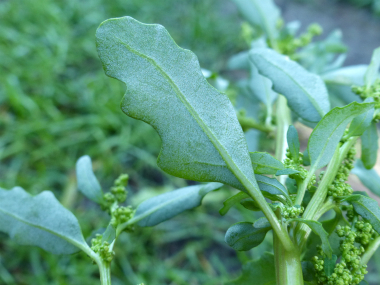 Fields of Nutrition has medicinal benefits and vitamin/mineral content of Oak Leaf Goosefoot. Leaves: The leaves are simple (lobed or unlobed nut not separated into leaflets). They are alternate and there is one leaf per node along the stem. The edge of the leaf blade has teeth. The petioles are up to 2cm. long; light green to yellowish red, and glabrous. The under part of the leaves are farinose (covered with fine granular or mealy coating). Height: This plant grows anywhere between 7 and 40 cm in height. Habitat: Oak-leaved Goosefoot grows anywhere in which the soil is nitrogen-rich. It may appear in gardens, on manure heaps, or in waste areas. Edible parts: The leaves are edible in small quantities and the seeds can also be consumed but only if they are soaked in water overnight to remove the saponins. Other name: Oak Leaved Goosefoot.